Entrepreneurship is not a business school discipline; it is a way of thinking that occurs across campus at every university. 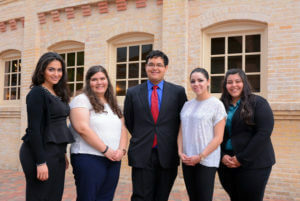 While most schools do not offer university-wide entrepreneurship education, the Entrepreneurial Scholars (E-scholars) Program at St. Mary’s University does. The E-scholars Program is a yearlong program that includes academic and extracurricular activities for students from all disciplines and majors. The E-scholars Program is housed in the Meadows Center for Entrepreneurial Studies, located in the Greehey School of Business. The program is a blend of traditional classroom learning with opportunities outside of the classroom that enhance entrepreneurial education and experiences. The E-scholars Program overcomes five common barriers to learning: isolation, time, limited expertise, rapid globalization and cost. This is achieved by securing sponsorships from individuals and businesses in the community. E-scholars attend classes designed specifically for them, go on domestic and international business trips, attend Forum Breakfast events and develop their entrepreneurial idea. They also have opportunities to network with entrepreneurs and executives from the business community. Students from all disciplines and majors are encouraged to apply for the E-scholars Program. Participants are selected through an application process in which they are evaluated on attributes such as interest in the program, motivation to learn, entrepreneurial propensity, academic performance, and career goals. The application process occurs in the spring semester of each academic year and those accepted matriculate through the program the following academic year. E-scholars Program participants are required to provide sponsors with periodic progress reports on their program activities and accomplishments. Jeffrey Johnson, Ph.D., Associate Professor of International Business and director of the Center for Global Business Studies. Johnson is the Faculty Representative from the Greehey School of Business. He teaches one of the courses and helps to advise and monitor the progress of the students from his school. Pamela A. Duffy, CAP-OM, Program Coordinator of the Meadows Center for Entrepreneurial Studies. Duffy is the staff representative from the Greehey School of Business. She helps support the progress of the program. The 2016-2017 E-scholars Program application process is currently closed.